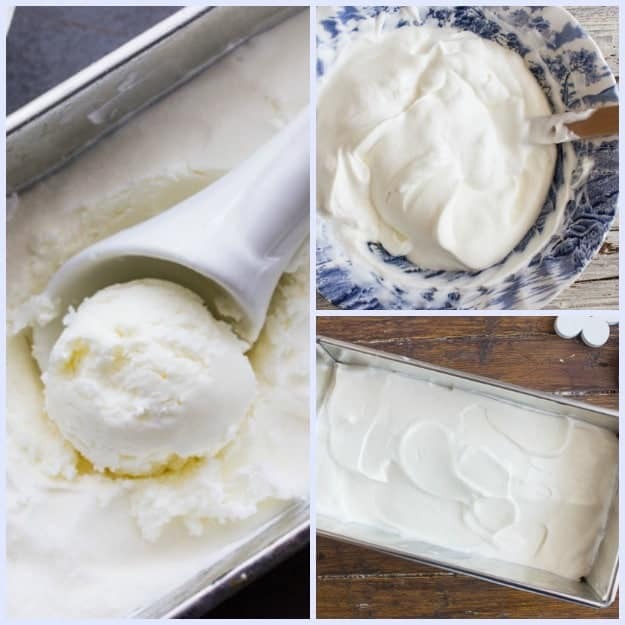 This No Churn Vanilla Ice Cream has only three ingredients and it is so easy to make. 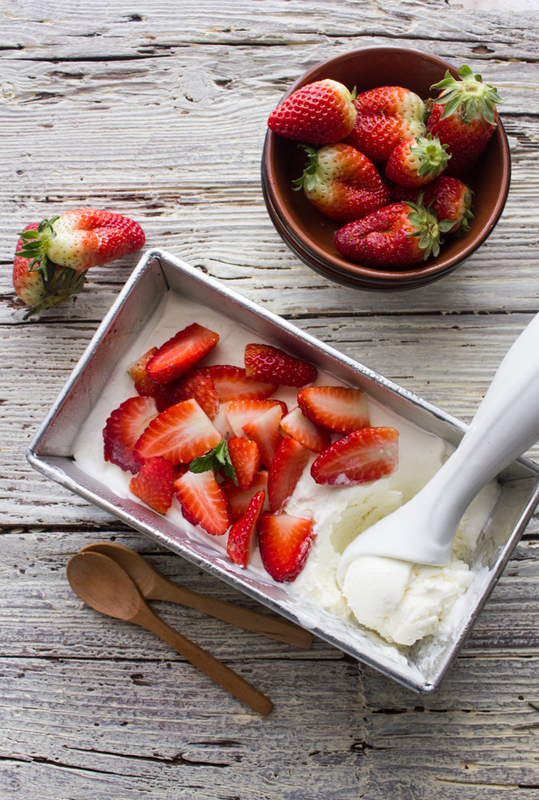 Homemade Ice Cream never tasted so good. Last week I made a Delicious Dessert Square which I will share with you on Friday. I thought to myself this would be perfect with a big scoop of ice cream. So what to do? Exactly make it yourself. The good part about it is, besides how delicious it is. Is that it only has 3 ingredients and takes about 15 minutes to make. If you put your beaters and bowl in the freezer for about 20 minutes to get them nice and cold before you whip the cream it will probably take even less time. The first time I made it I served it with some cut up strawberries, but actually any seasonal fruit would be amazing, just think peaches! And for those of you that like a certain Fast Food soft ice cream you will be pleased to hear that my daughter thought (and I did too actually) it tasted just like it! But creamier. Sometimes no matter how good a pie or tart is a nice big scoop of Vanilla Ice Cream makes it even better. And this No Churn Vanilla Ice Cream does just that. 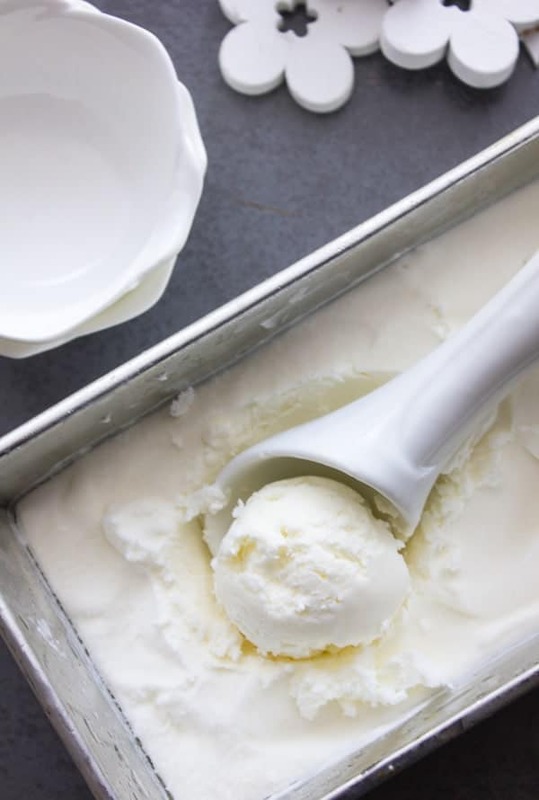 So next time you decide to make a Pie or Cake and you know you will be serving it with some ice cream, give this Homemade Ice cream a try, just remember to make the ice cream first and while it is in the freezer, get your Pie or Cake in the oven. By the time they bake and cool your ice cream should be ready too. Can’t you just imagine a delicious Homemade Apple Pie with a big spoonful of No Churn Ice Cream. Yes you can! Enjoy. 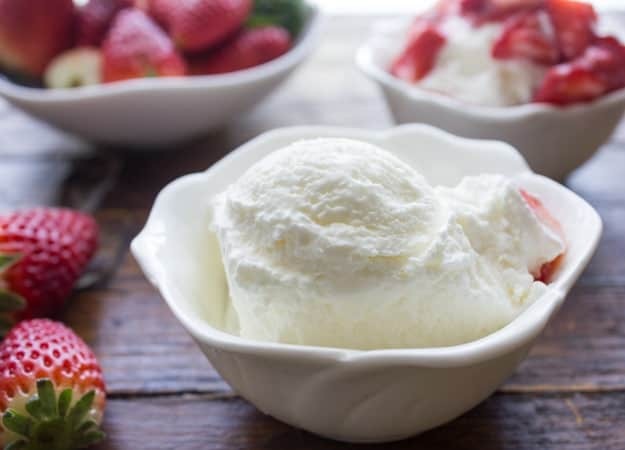 No Churn Vanilla Ice Cream, a fast and easy homemade ice cream dessert recipe. Only 3 ingredients, simple but so creamy and tasty. 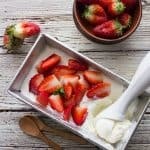 Remove one bowl from the freezer and whip the cream until stiff peaks form, add a little whipped cream to the vanilla/sweetened condensed milk mixture to make it easier to combine, then fold in the rest of the whipped cream mixture, place into a loaf pan 8x4 inch (20x10 centimeters). Then either cover in plastic or place loaf pan in a large ziplock bag and freeze at least 3- 5 hours until frozen or even overnight. Enjoy! Hi, How many servings does your vanilla ice cream recipe make? Thanks! Have an enjoyable Sunday! Hi Kimberly I would say about 4 servings. Have happy Sunday you too! Definitely making this for my grandchildren. They love vanilla ice cream. I love how easy it is to make. Thank you. Hi Ann, hope they enjoy it, let me know. Hi Kristen thanks so much. Have a great weekend.